Lorde's on the cover of Clash magazine and she's talking taking her songwriting skills to the bigtime. Her debut single "Royals" is in the middle of its third week at number one atop the U.S. Billboard charts, so it's not strange that she's the hottest thing since sliced bread nowadays. She kills it in the lyrics department, so it's only natural that the songwriting offers have been flowing in from a multitude of stars, including the super-popular Dr. Luke. "I haven't written for other artists yet but I definitely want to," the 16-year-old import told the magazine. She went on to explain, "Obviously lyrics are a huge part of my music, and they're so personal to me, so... it'll be such a challenge to step outside of my body. I can't wait." 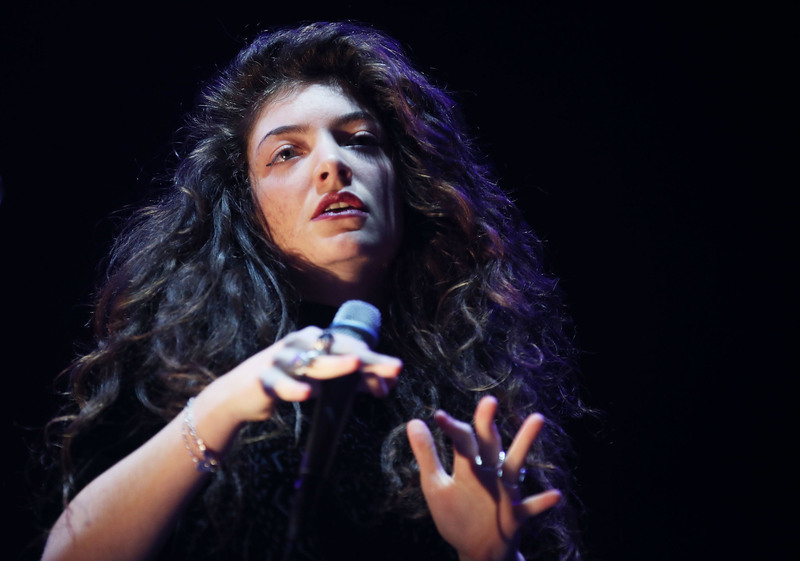 We can't either, Lorde, we can't either. Among the artists she's interested in working for/with are Rihanna ("because she's done EVERYTHING"), British darling Ellie Goulding and Dr. Luke (who's apparently already sent an offer her way). She gushes about being contacted by the songwriter, producer, instrumentalist, and remixer that's responsible for many of Katy Perry and Kelly Clarkson's biggest hits, "It's like, 'You're Dr. Luke. You're like Rambo.' He's pop royalty." After previewing her new album Prism (out on Oct. 22) earlier this week, we're absolutely not suggesting that she needs ANY help. Katy records some pretty great songs and has even penned a few hits her (Kelly Clarkson's "I Do Not Hook Up") so she and Lorde would be a great match. She's also one of Dr. Luke's girls and we already know that he commends Lorde's lyrical talents. It'd also be pretty fun and super nostalgic (think back to her One of the Boys days) to hear Katy Perry sing some Lorde-penned lyrics. Zedd's "Clarity" featuring Foxes made a stellar debut as "iTunes Single of the Week" last October and went on to peak at number eight on the Billboard Hot 100. Kind of a big deal for Zedd's first entry to the list. Combine Lorde's writing with Zedd's musical talents and it's sure to be a golden chart-topper that will be playing on repeat all over the world. Also, the thought of Lorde and Zedd sitting in the same room is just a coolness overload that could make my brain explode. If you haven't heard "Safe And Sound" in the past 24 weeks, you must be living under a rock somewhere. Capital Cities rocks and they're not the overnight success you might think they are, they've been carefully developing their songwriting/producing team for years before making their debut, which explains the knock-out success of "Safe And Sound". The song, which is pounding, catchy and layered peaked at number eight on the Billboard Hot 100.